Lynn M Jordan is a talented strategist who has devoted herself to representing clients in all aspects of trademark law. 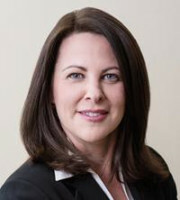 She is particularly adept at helping clients understand the business and legal risks associated with the adoption, use and registration of trademarks, and is recognised for her expertise in handling trademark matters for major entertainment, news and media companies, particularly regarding the interplay between trademark law and the First Amendment. Ms Jordan has handled countless clearance, prosecution and enforcement matters involving trademarks used as titles of or elements in motion pictures, television programmes, books and video games, as well as collateral merchandise associated with these properties. as a recommended trademark lawyer by Legal 500 (2014 and 2017). Ms Jordan is an active member of the Association of Intellectual Property Firms, where she serves on the board of directors and is the treasurer. She is also active with the American Bar Association’s Communications Law Forum. Prior to co-founding Kelly IP, Ms Jordan was of counsel at Finnegan, Henderson, Farabow, Garrett & Dunner, LLP in Washington DC.